So, I realise that I have been a tad slack with recipe posts lately and as such have decided to reward my loyal readers with a brand new original recipe. One such reader, Angela *waves!! *, recently requested for me to put up more vegetarian friendly recipes. I know! “Where is the bacon?”, you may ask. But I thought, hang on, I am on a health kick here. This recipe is not only tasty, but is also very quick and easy to make. So I present to you a delicious home cooked Tofu Stir-Fry with Ginger and Pickled Mustard Greens. Heat up 3 tablespoons of olive oil (or substitute with vegetable oil) in a wok on medium heat and pan fry the tofu slices until it turns golden. Once all the tofu have been fried, dish up and set aside (on a wire rack to cool or on some paper towels to drain off excess oil). Heat up another 2 tablespoons of oil (on medium heat) and toss in the ginger and shallot into the wok. Once the shallot starts to brown, toss in the pickled mustard greens and continue to stir-fry for a minute. 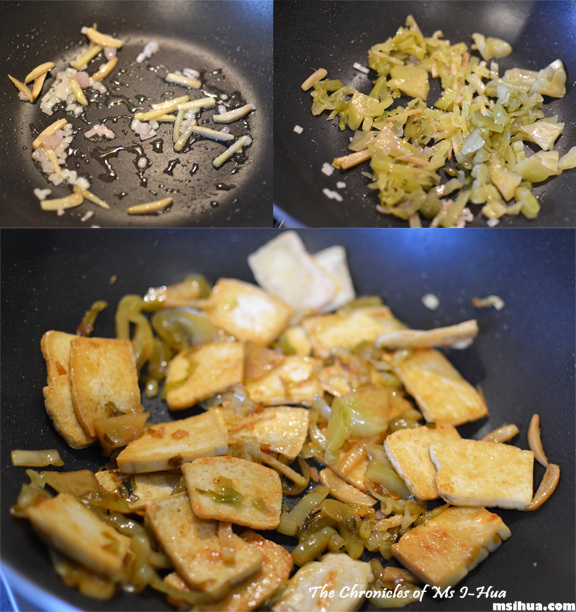 Add the fried tofu slices into the mix and stir-fry, adding in the sauces and sugar. Once all the tofu slices have been coated in the sauces, turn off the heat and dish up. Serve hot with steamed rice or eat it on its own! If you find this dish a tad too dry, you can serve it with dipping sauce such as sweet chilli sauce or hot chilli sauce. 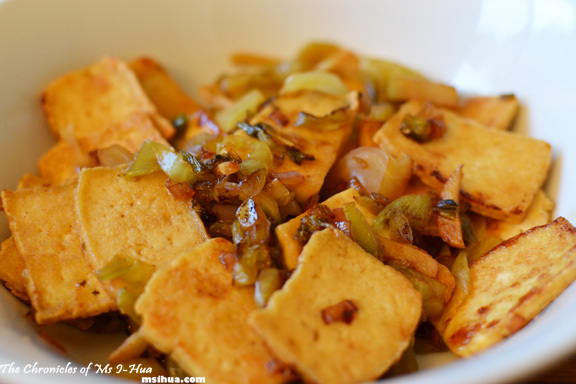 So tell me, what is the quickest and tastiest tofu dish you have made? Don’t you find it too salty? Quickest also = weirdest for me. I mash up cold firm tofu with nooch and vegemite or dijonnaise. Bahahaha! That is very weird. Even for you. No meat! What next… 😉 Well, for an omnivore I do rather adore tofu and this looks great! I know.. such a weird characteristic in me! 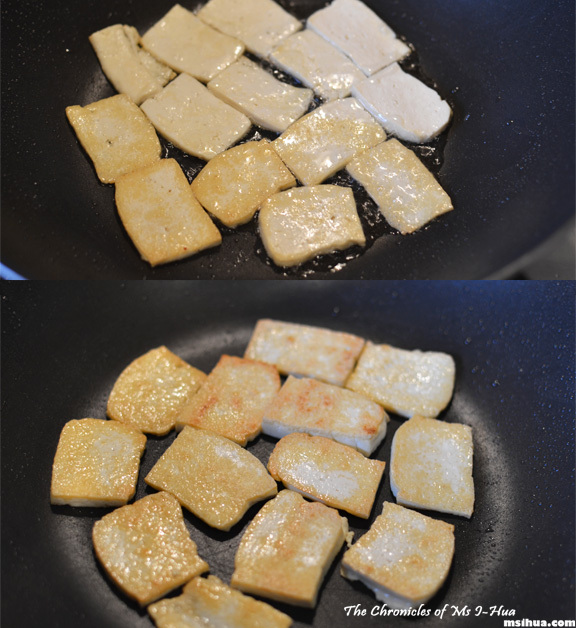 I’ve never thought of slicing tofu so thinly and searing it – great idea! 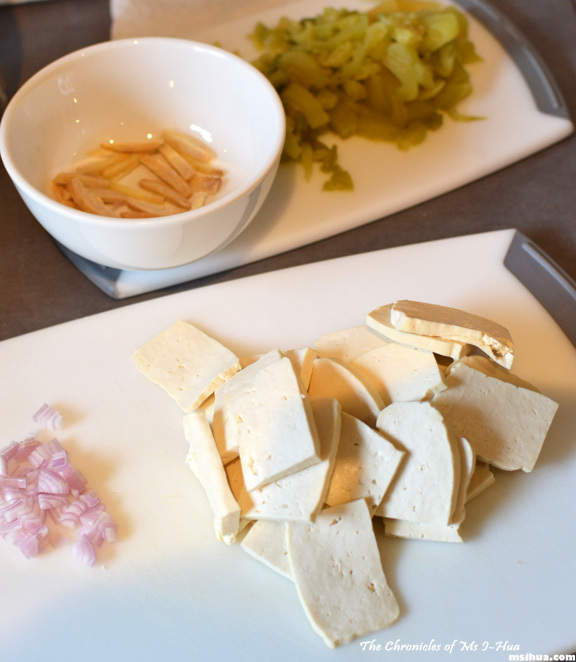 The quickest tofu dish that I love is mapo tofu which is a simple stirfry of marinated mince pork, tofu cubes, yellow bean paste, chinese chilli sauce and topped with diced shallots. It’s a simple and yet delicious comfort food. I know! I am brilliant that way 🙂 I love mapo tofu! It is very Asian and also what was in my pantry ! I’m glad I requested some veggie recipes too – I enjoy eating meat but think great veggie dishes are v.exciting! Looks delicious. 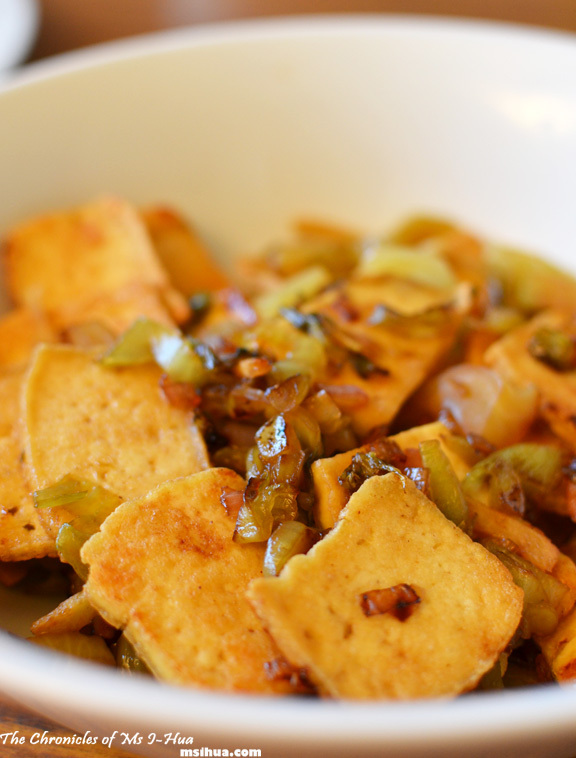 I am still trying to convince my husband on the merits of tofu but this recipe could convert him. Yayy!!!! I’m so glad you liked it! I do hope it is as delicious for you as it is for me! It’s definately going to be a regular. Really tasty! Ooo.. my best bet would be in Little Saigon in Footscray or any of the Asian markets in Richmond and Springvale!